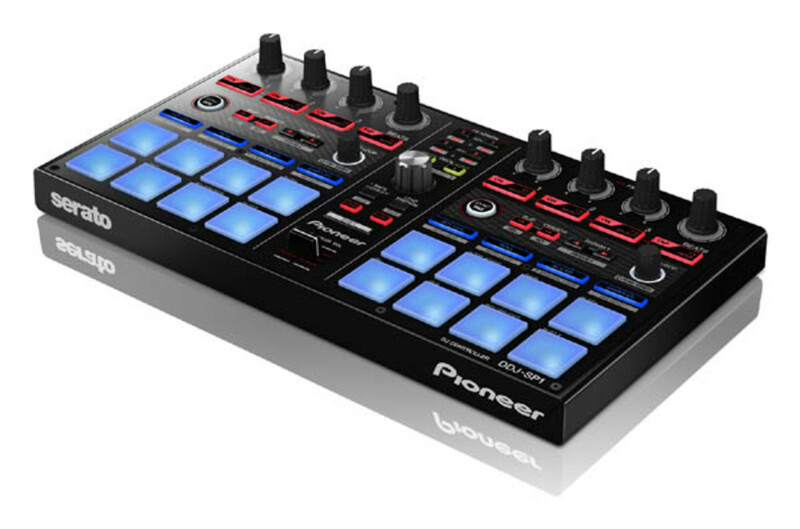 Pioneer DJ has released the DDJ-SP1 USB MIDI controller that is designed to work in conjunction with the new Serato DJ 1.5+ software so users can trigger new effects and samples with the 16 velocity-sensitive performance pads, buttons, and knobs in a nice compact package. The DDJ-SP1 is designed to be used as a "sub-controller" that works in conjunction with a primary Serato DJ controller or a Mixer+DVS setup to offer the advanced features found on the popular Pioneer DDJ-SX controller to all Serato DJ users. The DDJ-SP1 can also be used with absolutely any Serato DJ DVS setup and it matches up nicely with the recently reviewed Pioneer DJM-900SRT Mixer for a dual-controller style setup to trigger advanced features in the Serato DJ software. The DDJ-SP1 has a nice compact size but is still made with a mostly metal body for great durability. The construction of the DDJ-SP1 is really good with all of the knobs having metal posts underneath for even more strength. All of the buttons and pads have a single color LED indicator so that users can easily tell what is active at a glance. The Setup of the DDJ-SP1 is very simple. 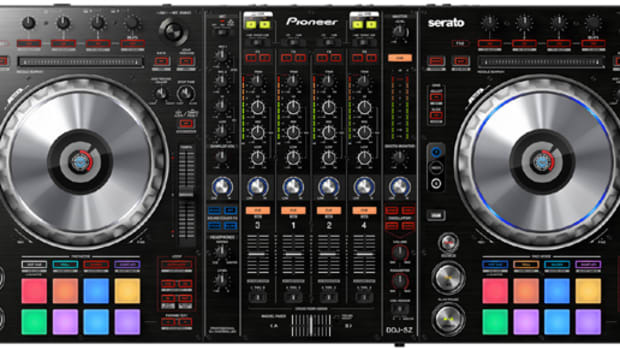 The DDJ-SP1 does not come bundled with Serato DJ, so the user already has to have the full version of Serato DJ already activated and ready to go on their computer. This means that the user will already have the hardware necessary to use Serato DJ as well. This could either be a DJ controller working with Serato DJ or a Digital Vinyl Setup that requires a Serato DJ Compatible Mixer or Rane SL interface. 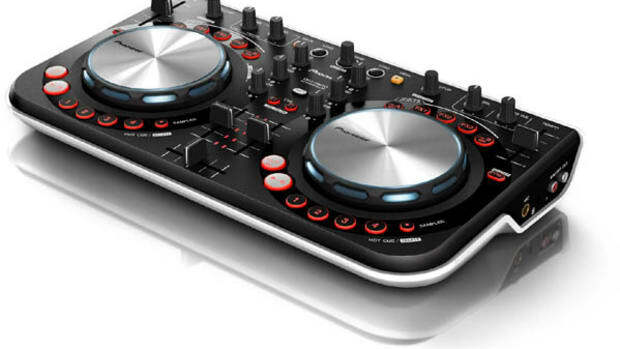 Once the DDJ-SP1 is connected to the same computer via the supplied USB cable it is ready to use. There was no additional setup needed. It was simply plug-and-play. The DDJ-SP1 has lots of the controls found on the super-popular DDJ-SX controller including the 16-velocity sensitive pads that are used to control hot cues, samples, loops, roll, and samples. When added to a setup, many of the advanced DDJ-SX controller features will now be accessible via the auxiliary DDJ-SP1 controller. 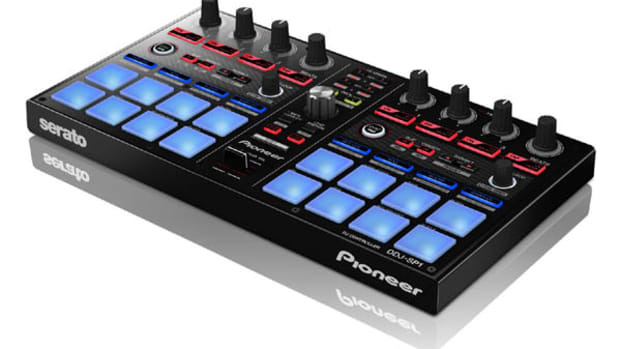 The DDJ-SP1 can manipulate up to four different decks via a layered deck button control scheme. The controller is split into two sides where the left side will control Decks 1 and 3 while the right side controls decks 2 and 4. In the Middle of the DDJ-SP1 there is a big oversized push-button silver encoder knob that allows users to easily navigate through the Serato DJ software folders and playlists. Above the knob is the Deck layer buttons 3 and 4 that will activate those decks on either side of the DDJ-SP1 when highlighted. When the shift button is pressed, the Deck buttons become Panel Select buttons which will cycle through the different panels in Serato DJ. Above the Deck buttons are the FX Assign buttons which will assign the FX1 and FX2 modules to a particular deck. The user can press shift and the Deck FX Assign buttons in order to assign the effects to Decks 3 and 4. Below the huge silver encoder knob is the Back button that also works as a Utility button when shift is pressed to change certain options of the DDJ-SP1. There is also a Load/Prepare button and Load buttons that illuminate so that the user can load a particular track to the deck that is active on the respective side. Below the Load buttons is the big Shift button that will add additional layered controls to some buttons and knobs. There is a sampler volume fader knob under the shift button to control the volume of the SP-6 sample player in Serato. The best feature on the DDJ-SP1 is the inclusion of the 16-performance pads that control multiple functions similar to the DDJ-SX controller. These 16-performance pads were pulled directly from the DDJ-SX and have a rubberized feel to them and they are really made for performing. There are 8 pads per deck and all of them are velocity-sensitive (meaning they can register how hard they are hit) and they have a blue backlit to them as well. There are no RGB multi-colored LED&apos;s in these pads, so you can&apos;t really tell at a glance what mode they are in without checking the Pad Mode section first. These pads don’t have the absolute click-sound that you get when you press the buttons of the Traktor F1, but you can still see per the backlit when each button registers an actual hit. I didn’t have any issues using the pads and they are sensitive enough to register the hit even when pressing the corners or sides of the actual Pad. These Pads are used to control Hot Cues, Roll, Slicer, and Sampler. When Shift button is pressed, the Hot Cue mode turns to Hot Loop, Roll turns to Auto Loop, Slicer turns to Manual Loop, and Sampler turns to Velocity Sensitive Sampler mode. The breakdown of each Pad control feature is listed below. Hot Cues/Hot Cue Roll – These 8 pads turn into 8 hot cue points for each deck when Hot Cue button is pressed at the top. To set a cue point, simply let the track play and press a Cue Point pad at the time you wish to save the Cue. In order to recall the cue, simply press the button. To delete the cue, hold down the shift button and press the pad of the cue point you want to delete. It’s simple, clean, and lots of fun to drum in cue points with the pads. The Hot Cue Roll will loop or repeat the hot cue according to the size that the autoloop is set to. Roll/Auto Loop – The Roll function starts an auto loop for the length that the pad represents. The first pad is the shortest, second pad is longer, etc. This is a loop with slip-mode activated that allows the loop to activate when pressed, but the play-head returns to its normal position as soon as the pad is released. The Auto Loop function is the same as the Roll function but without the Slip function. The loop stays active and when released, the play head continues from the end loop point. Slicer/Manual Loop – These 8 pads turn into eight small “slices” of different sections of the song that is currently being played. Basically the Slicer divides a portion of the song into eight smaller pieces that can be rearranged and played back in different order depending on how and when you hit the pads. The software remembers where the song would have been during playback if you hadn’t touched the slicer in the first place, so the song returns to the normal playing position when you are done “slicing” it up. There are two slicer modes where one remains on a loop of those 8 slices, while the other mode allows the user to keep that individual slice going throughout the song as long as the pad corresponding to that slice is held. Manual Loop Mode lets the user set their own In and Out points by using the performance pads. Users can also reloop and save loops using different pads as well. Sampler/Velocity Sampler – In order to get the sampler mode on-screen, the user must first activate the SP-6 Panel.. There are a total of 12-samples per side for a total of 24 samples that are ready at any given time. The First six buttons are the actual sample banks while the two remaining buttons allows the user to scroll through the (4) pages of available sample banks. When the sample button is pressed, the sample plays in the mode that is selected. In Velocity Sampler mode, all the pads are the same, but the volume of the sample will vary based on how hard the pad is struck. Above the Pad sections there is a round illuminated Sync button which allows users to sync BPM according to Serato for that corresponding deck. Pressing Sync and shift turns Sync off. Next, there is a Slip button which allows users to enter Slip Mode. Slip mode will allow users to manipulate a track using loops and cue points, but as soon as the slip mode is turned off, the track plays exactly where it would have been if there were no manipulation at all. Next there is a Censor button that allows users to temporarily play a track in reverse so "bleep" out any unwanted language or sounds. Next, there are lef tand right parameter buttons that will change parameters of loops, slicer length, etc. To the right there is an Auto Loop knob that when pressed will engage an Automatic Loop at the pre set length. Users can turn the knob to shorten or grow the loop. 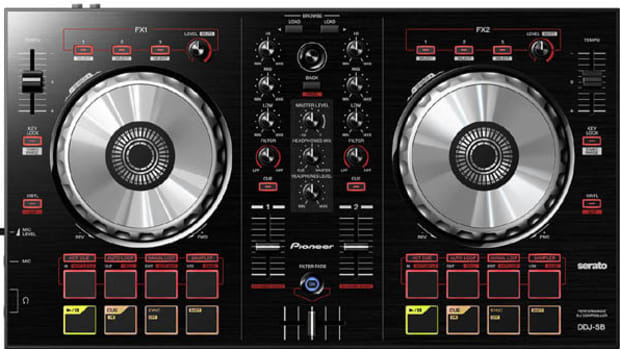 All the way to the top of the Pioneer DDJ-SP1 are the effects controls. Above the left side there is an FX1 module and above the right side there is an FX2 module. Both effects modules have four rubberized knobs and an illuminated button underneath each knob to set different parameters of each effect. Users can now have up to three effects per module using the new Serato DJ iZotope effects and they work just as good here as they do on the DDJ-SX. Even though the DDJ-SP1 is designed to work with Serato DJ 1.5+, it is still a class compliant MIDI controller meaning it can be programmed to work with any MIDI-compatible DJ software out there and Pioneer now has a Traktor .TSI mapping file ready to go on their website for free download. The DDJ-SP1 also has a dedicated Serato Video Mode that allows users to add effects and transitions to the Video mix. In Conclusion, the Pioneer DDJ-SP1 is the perfect Serato DJ sub-controller for users who don&apos;t have access to performance pads controls and advanced features like Slip-Mode and Slicer. The DDJ-SP1 is an excellent DVS companion controller for users who are still using tone control vinyl and CD&apos;s but want the new features of Serato DJ to expand their arsenal. 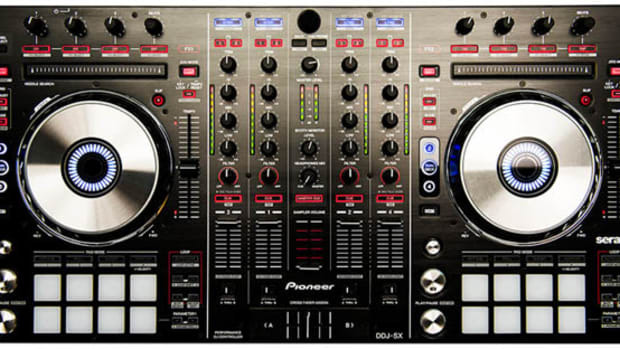 The DDJ-SP1 has a compact footprint and solid build quality. The DDJ-SP1 also brings the DDJ-SX 16-Performance Pads to control functions like the Sampler, Hot Cues, Roll, Loops, and Slicer. 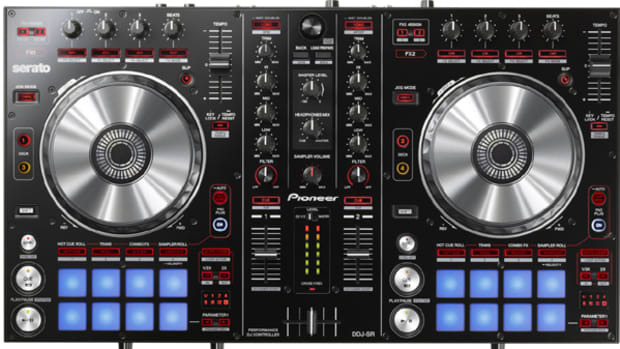 The DDJ-SP1 also has a complete effects section and easy-to-use navigation controls. The only minor gripe that I could find with the DDJ-SP1 is that the performance pads are not RGB multi-colored so the user can&apos;t tell at a glance what each pad represents. All in all, the Pioneer DDJ-SP1 was really fun to use while working in Serato DJ and I highly recommend it to any user who wants to take advantage of the cool pads section and wants the additional controls over the software that their primary controller or DVS setup would ever allow them to achieve.